Upgrade your Prism™ projector to a Super Prism® with this 3-element, color-corrected lens for finer detail and increased image clarity up to 20 times enlargement. This entry was posted in Accessories, Projector Accessories and tagged color-corrected lens, Prism, projector, Super Lens, Super Prism on April 9, 2014 by Artograph. This entry was posted in Accessories, Projector Accessories and tagged Prism lens, Prism projector, Prism table stand, Super Prism, table stand, table-top projection on April 9, 2014 by Artograph. The Super Prism® is designed for the artist or designer who needs the best in image clarity and accuracy. 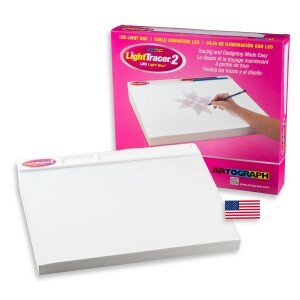 Ideal for working from a variety of challenging originals like photographs, half tones, and highly detailed drawings. Features a 3-element, color-corrected lens for extra sharp images and increased brightness. This Super Lens enlarges originals from 2 to 20 times. Includes extra accessory lens to extend the range from 3 times enlargement down to 20% reduction. *Includes 500-Watts of photo quality lighting for a whiter and brighter image. Magnetic door latches and a spring clip keep copy securely in place. Generous 7 x 7 inch (177.8 x 177.8 mm) top-loading, glass covered copy area makes for easy placement of large copy, books, or small 3-D objects. A fan cooling channel system and thermal overload circuit protect originals from overheating. Dark room required. How do I do reduction with my Super Prism? How far back do I have to be to get 20x enlargement? This entry was posted in Prism Projectors, Projectors and tagged Prism, Prism projector, projector, Super Lens, Super Prism on April 8, 2014 by Artograph.